Are the End of the Year Holidays a Good Time to Start a Business? The holiday season is a busy time of year. So busy that most people don't want to take on new projects, especially one as big as starting a home business. However, the holidays may be the best time to launch your venture. If you're putting off starting a home business until after the new year, you may want to reconsider. 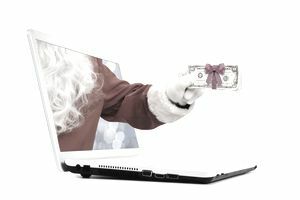 Here's why, along with some tips on starting a successful home business during the holidays. People are spending money. If you have a business that can cater to holiday shoppers, such as gift items, baked goods, catering, cleaning or decorating services, and more, the holidays are an ideal time to jump start your venture. You may be able to reap tax advantages by starting a business before the end of the year, such as the office-in-home tax deductions. Holiday sales mean you can pick up any needed business and home office equipment and supplies at a discount. Many services go on sale during the holidays as well. This means you can save on your start-up costs. Starting a business isn't something you should do on a whim. It takes research and planning, including developing a business plan. While the holiday season is full of buyers, other times of year sales might slow down. Most businesses have an ebb and flow. To keep your business making money, you need to have a marketing plan that goes beyond the holidays. It takes time to build up sales. Even with an eager buying market, launching a business and getting the word out can take time. The holidays pull you in many different directions, and your family may not be supportive of your taking time to start a business. 1. Get organized. Fitting in the tasks that go with starting a business into an already busy schedule requires organization, planning, and time management.. Decide when you'll work on your business, and if it will take away from family time, work to get them involved or at least on board with your plans. 2. Decide what home business you'll start. It's important to choose an idea that you'll enjoy and stick with, but it doesn't hurt to start a business that you can be targeted to holiday needs, and yet continue after and though out the new year. 3. Make a list of all the home business startup tasks you need to do. The Balance offers a 4-week home business start up guide that tells you everything you need to do to get your business up and running in 30 days; sooner if you work through the tasks quicker. 4. Get your financial house in order. The holidays are a good time to make money, but it's also a time you spend money. There are many ways to start a business on a budget, but it's important that you run the numbers so you can get into the black in your home business as quickly as possible. 5. Take care of the legal details. Starting a business, even as a sole proprietor, usually requires getting a business license. If you sell tangible goods, you may need to charge sales tax, which you'll need to get a permit form your state tax agency to do. Some businesses require additional licenses or permits so you'll want to check your state's occupational regulation agency about any your business might need. You may decide to structure your business as a limited liability company (LLC) instead, which requires filing with your state. Requesting an Employer Identification Number (EIN). If you set up an LLC, you'll need one even if you don't have employees. Set up your financial and other important reporting systems. 6. Create a marketing plan. Focus on how your business is unique or better to attract customers. Because you're starting during the holidays, create a plan that ties your business into holiday buying. If you'll continue your business after the holidays, you'll want to re-do your marketing plan to fit non-holiday times. 7. Start and go, go, go. To take advantage of the holidays when starting a business during this busy time, you need to sprint out of the gate. During other times of year, you can afford the time it often takes for marketing to deliver results. But during the holidays, your time is limited, so you need to be active and consistent in your marketing. There are host of free marketing strategies you can use. Plus there are off-line marketing tactics that can work as well. The most time consuming part of home business is the start up. So even if you're unable to fully capitalize on the holiday buying time in your new home business, you'll have something already up and running that you can build in the new year. The key is to continue marketing and delivering a quality product or service.